California's Central Valley aquifer, the major source of groundwater in the region, suffered permanent loss of capacity during the drought experienced in the area from 2012 to 2015. California has been afflicted by a number of droughts in recent decades, including one between 2007 and 2009, and the millennium drought that plagued the state from 2012 to 2015. Due to lack of water resources, the state drew heavily on its underground aquifer reserves during these periods. According to new research, the San Joaquin Valley aquifer in the Central Valley shrank permanently by up to 3 percent due to excess pumping during the sustained dry spell. Combined with the loss from the 2007 to 2009 drought, the aquifer may have lost up to 5 percent of its storage capacity during the first two decades of the 21st Century, according to Manoochehr Shirzaei, an assistant professor of earth sciences at Arizona State University in Tempe and one of the co-authors of a new study published in AGU's Journal of Geophysical Research: Solid Earth. Groundwater exists in the pore spaces between grains of soil and rocks. When fluids are extracted from aquifers, the pore spaces close. There is a range for which these spaces can shrink and expand elastically. But if the pore spaces close too much, they start to collapse, causing the land to shrink irreversibly. Figuring out how much the aquifer shrank permanently could help water managers prepare for future droughts, according to the study's authors. The San Joaquin Valley aquifer supplies freshwater to the Central Valley – a major hub that produces more than 250 different crops valued at $17 billion per year, according to the U.S. Geological Survey. "If we have even one drought per decade, our aquifers could shrink a bit more each time and permanently lose more than a quarter of their storage capacity this century," said Susanna Werth, a research assistant professor of earth sciences at Arizona State University, and a co-author of the new study. The new study could also help scientists understand how other areas might be affected by drought. "That was a curiosity for us to understand how much groundwater has been lost in those particular regions and will give us a picture of what we can expect for arid areas around the globe if groundwater practices are not sustainable," said Chandrakanta Ojha, a post-doctoral researcher at Arizona State and the lead author of the new study. The researchers measured water volume changes due to groundwater variation in the aquifer using data from the Gravity Recovery and Climate Experiment (GRACE), a twin satellite mission that has been measuring the Earth's gravity field every month from April 2002 until June 2017. The study's authors compared the groundwater losses based on GRACE measurements with those calculated from vertical land motion measurements obtained by GPS. 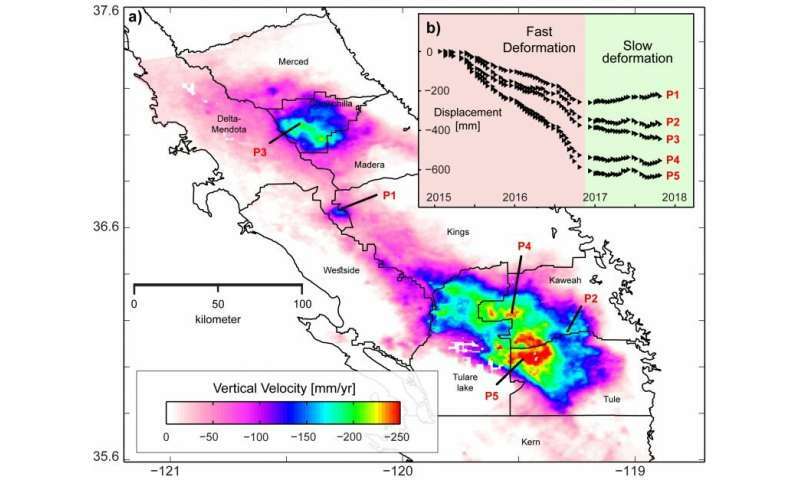 Land depressions were also measured by a radar technique called InSAR and multiple extensometers, devices which are installed in a borehole of a groundwater observation well. They also examined groundwater level records. The study's authors found that from 2012 to 2015, the aquifer of the San Joaquin Valley lost a total volume of about 30 cubic kilometers (7.2 cubic miles) of groundwater. The aquifer also shrank permanently by 0.4 percent to 3.25 percent, according to the new study. Previous research found the 2007 to 2009 drought caused the San Joaquin aquifer to permanently lose between 0.5 percent to 2 percent of its capacity. Cumulatively, the authors said both drought periods – 2007 to 2009 and 2012 to 2015—caused the San Joaquin aquifer to shrink permanently by as much as 5.25 percent. Shirzaei said the information they have gathered is important for future planning—particularly since the loss of permanent storage capacity is unsustainable in the long-run. By using this type of calculation, Shirzaei said land and water resource managers can predict the effect of droughts on the aquifer system. This can help to make better regulations for groundwater conservation during those periods and prevent permanent loss of aquifer storage capacity. Shirzaei said the compaction of the aquifer may also cause fissures and cracks on the surface as the land subsides. This could affect roads, power lines, railroads or other infrastructure, but more research is needed to understand the details of these effects.